STRATIFICATION TECHNIQUE IN MAXILLARY ANTERIOR INCISORS RESTORATION. Janet Kirilova1 , Dimitar Kirov2, Snezhanka Topalova-Pirinska1. Medical University - Sofia, Bulgaria. Background: Because of their main characteristics: transparency, opalescence and color density, the tooth structures are extremely difficult to restore by means of completely inconspicuous restorations of the natural tooth tissue characteristics. The aim is to show successful aesthetic restoration of III Class dental lesions in upper incisors by means of high quality composites. Materials and method: A female patient visited the clinic being not satisfied with the esthetics of her front teeth. The intraoral examination showed previous restorations and carious lesions in 12, 11, 21, 22. After defining the tooth color a silicone key was made. The treatment was performed under anesthesia, the existing restorations were removed and the carious lesions in teeth 11, 12, 21, 22 were treated with restorations using Vanini edge preparation. The teeth were restored by means of stratification technique. After etching and rinsing, bonding was applied for 20 sec. and then polymerized. After fixing the silicone key enamel shade was applied and then dentine shades UD2, UD3, UD4 of 0.5mm thickness each. The polymerization was done layer by layer. Applied were 10 to 15 layers in total. The composite material was preheated in oven up to 55. Teeth 21 and 22 are restored with Enamel Plus HRi (Micerium). Results and Discussion: Excellent aesthetics is achieved with composite material. They have enamel and dentine shades and allow high quality aesthetics. The polishing is excellent in Enamel Plus HRi (Micerium) which is typical for this type of composite. The result of the carious lesion treatment in this patient is real improvement of the dental appearance of her anterior incisors. Conclusion: Materials show excellent aesthetic results due to their characteristics and the stratification technique used. Kirilova J, Kirov D, Topalova-Pirinska S. Stratification Technique in Maxillary Anterior Incisors Restoration. J of IMAB. 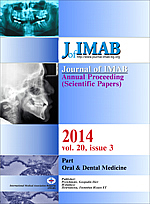 2014 Jul-Sep;20(3):550-553. doi: http://dx.doi.org/10.5272/jimab.2014203.550. 1. Finlay SW. Stratification: An essential principie in understanding class IV composite restorations. J Cosmetic Dent.2012 Spring;28(1):32-4. 5. Snyder TC. Conservative replication of nature with a Class IV Direct composite.Understanding stratification to emulate nature’s optics. J Cosmetic Dent. 2012 Spring;28(1):22-8. 6. Terry DA, McLaren EA. The interproximal zone: a Class III restoration. Contemp Esthetics. 2001; 5(11):46-56. 7. Terry DA. Finishing and polishing for function, esthetics and longevity. Esthet Tech.2002: 2: 3-13. 9. Vanini L. Conservative composite restoration that mimic nature. A step-by-step anatomical stratification technique. J of Cosmetic Dent. 2010 Fall;26(3):80-98. 10. Villarroel M, Fahl N, De Sonsa AM, De Oliveria OB Jr. Direct resin restorations based on translucency and opacity of composite resins. J Esthet Restor Dent. 2011 Apr:23(2):73-87. [PubMed] [CrossRef].